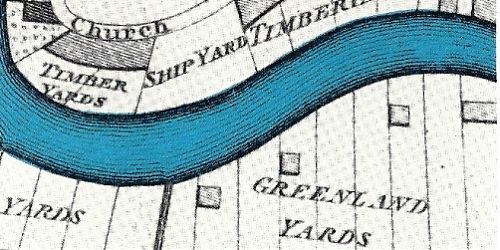 Over the past six months, I have been researching the historic whaling trade based in London, and attempting to understand how two large pieces of whale bone became incorporated into a timber structure on the foreshore in Rotherhithe. So, whilst reading Philip Hoare’s Leviathan or the Whale, I was delighted to find an image that actually showed a whaling ship with numerous whale jaw bones suspended from its masts, and to discover that the fantastically gruesome painting, Harmony by James Wheldon is on display at the Maritime Museum in Hull. Intrigued, I managed to contact the museum’s curator of maritime and social history, Robin Diaper, and arranged a visit. 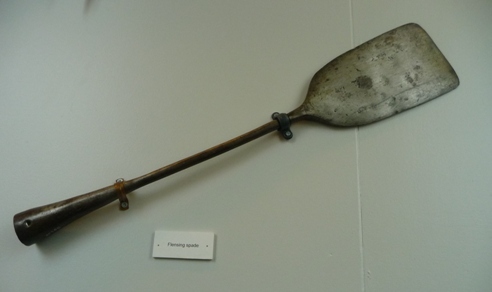 When I arrived, Robin came to meet me and showed me around the museum’s whaling gallery. 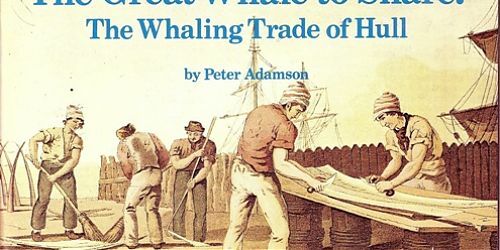 The exhibition tells the story of hugely profitable Arctic whale trade that grew up in Hull from around 1760 until the mid-1880s. 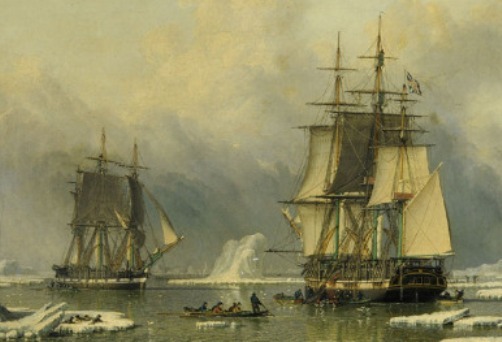 The collection is amazingly varied, showing a number of paintings of ships in the Arctic by local Hull artists, with grisly details of the pursuit, capture and butchery of whales, seals and polar bears. 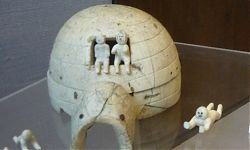 Some, like Weldon’s, included whimsical imaginings of the shapes and colours of the Arctic landscapes. 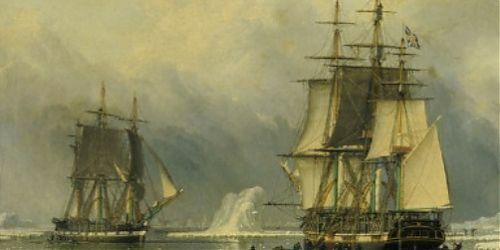 By contrast, the levels of detail and accuracy in others such as The Swan and Isabella by John Ward (above) suggest that the artist had actually been to the Arctic, and seen whalers in action. On this painting you can see the flensing operation (removing the blubber from the whale carcass), with jaw bones suspended above the whalemen. 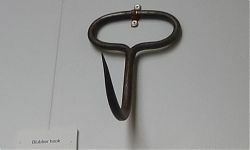 There are also a number of very specialised tools and implements on display, all with particular uses in the sequence of whaling, including a pair of spurs, that enabled whalemen keep a strong footing whilst standing and working on the slippery carcass, and also various points, knives, hooks (image above) and spades (image below) that would have been kept razor sharp in order to remove the blubber, jaw bones and baleen from the whales’ bodies. 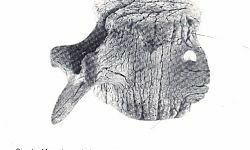 The articulated skeleton of a young female Northern Atlantic Right Whale, although a twentieth century acquisition, gave a sense of scale to the whaling enterprise. 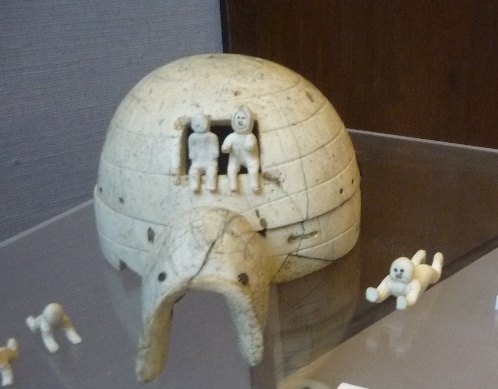 The range of Inuit artefacts, like the igloo shown below, and stories about the cultural contact that the European whaling operations instigated offered thought-provoking insight into the complex implications of the trade, and its global reach. As well as showing me around, Robin was kind enough to give me access the extensive collection of reference books held at the museum, which cover a variety of aspects of the history of whaling, both in Hull and on an international scale. 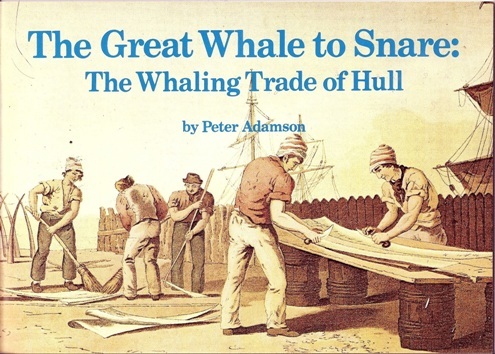 I purchased a short, but incredibly informative publication, about the whaling trade of Hull from the museum bookshop, the front cover of which showed ‘whalebone scrapers’ processing baleen in the most expedient ‘workshop’ space imaginable – a table made from barrels, set up virtually on the banks of the river. 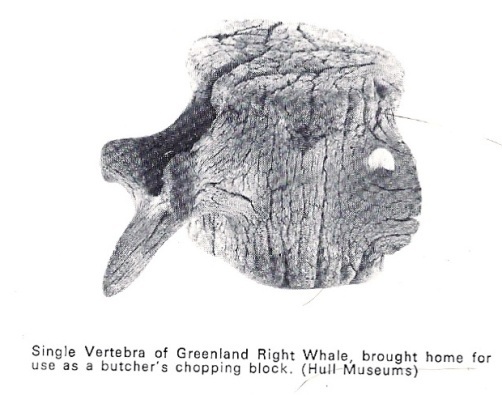 It was also great to see the two examples of Right whale vertebra (over 30cm in diameter), complete with cut marks, that had apparently been brought home and used for butchers’ chopping blocks – Robin even told me that he had met somebody who could remember working in a butcher’s with one of these! 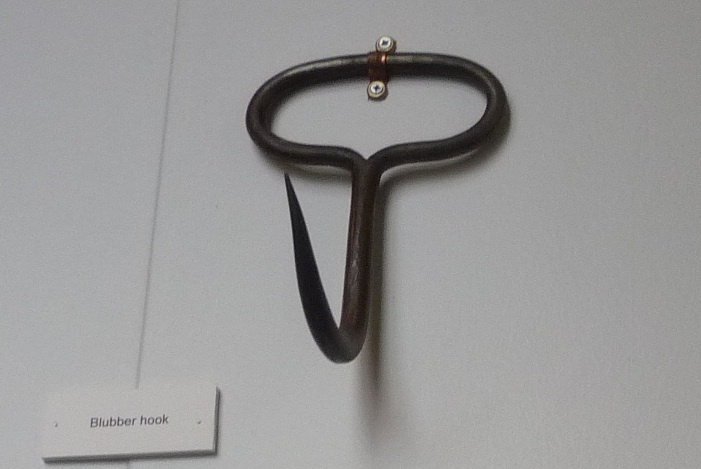 I do have to admit though, that I was slightly disappointed that the museum did not have any pieces of whale jaw bone similar to those at the Rotherhithe site. 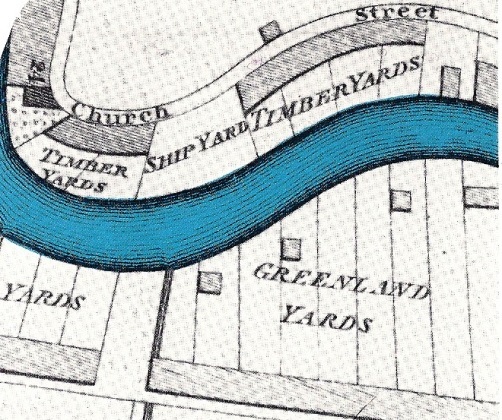 ‘Greenland Yards’ where whale blubber was rendered into oil, and baleen was processed are shown on contemporary maps, opposite ship and timber yards on the River Hull. These were probably similar to the rendering plant at the Rainbow Quay site next to Greenland Dock in Rotherhithe, but I cannot find any records of the Hull yards being excavated, or any whale bone being found there. So if, like me, you have an interest in this sometimes grim, but always fascinating aspect of the pre-industrial age, I highly recommend a trip to Hull to see the selection of photographs, paintings and objects on offer – you won’t be disappointed!